Mature Wedding Dresses? Yes . . . they do exist. 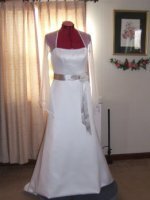 The following information will give you suggestions on where to find a wedding dress for the mature bride. Search the web for wedding dress designers with informal gown collections. Informal gowns usually don't have long trains and are less ornate... which is the preferred style of gown for mature brides. If you prefer a wedding dress alternative, such as bridal suits or wedding 2-piece special occasion dresses... you will find these among the mothers of the bride gowns. You can order your wedding attire online or at a bridal shop. Make sure you know what the return policy is. Always pay for your bridal gown with a credit card. If there is something wrong with the dress, you can resolve the matter through your credit card company if you can't come to an agreement with the store. Go to the designers’ web site for a list of the stores in your area that carry their designs. A wedding shop can order the bridal gown for you, even though it may not be in the store. Most bridal stores have a no refund, no exchanges policy so if you order your dress, you must be sure you like it. Some stores will allow you to exchange it for something in the store. But if that option isn’t available you will be stuck with the gown. Planning to order a gown from a catalog or from a web site? What can you do to find out if a particular style will look good on you before ordering it? Try this... go to a store and try on a dress in a style similar to the picture of the wedding dress you want to order. If your dress in the catalog or website is similar to what you try on ... then you probably will like the dress you want to order. Just take time to find out what looks good on you first, then you will not be disappointed! Mature Wedding Dresses Finder: Where to search for your dress. I feel the designers below have a nice selection of gowns to choose from. To get you started here are a few designers that I noticed had informal wedding dresses that mature brides might like. Mon Cheri Bridals has a large selection of mothers dresses that can double as wedding outfits. I have altered these gowns and they are well made and of good quality. Mori Lee Bridals carry nice informal wedding dresses a mature bride might like. Casablanca bridals has unique styles. Watters and Watters has a nice line of simple wedding dresses. When searching for mature wedding dresses try looking in some of the better department stores. The formal wear department could have something you could use. Dillards, JC Penney, and Nordstrom are just a few stores some mature brides have been successful in finding a wedding outfit. Macy's and Bloomingdale's actually sell wedding dresses online. You may have a dress boutique in your town that specializes in formal wear. If they don’t have what you like in the store they can usually order it for you. Here is an online source where you can order mother of the brides dresses and wedding dresses that are appropriate for the mature bride. Read my review of BestBridalPrices.com. to see why this online bridal shopping source is my number one pick! Here's a poll to do for fun! What style of neckline are you looking for? If you checked other... what neckline style are you looking for?